I had a total “pinch me” moment last week. Well, it was actually a “pinch me” couple of days! 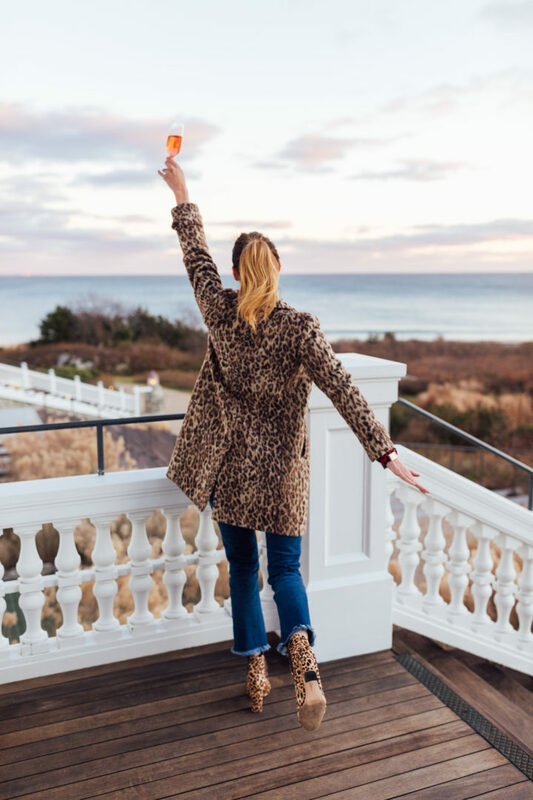 Last week I went on a little getaway to The Ocean House, one of my favorite resorts ever (Marlowe and I first went there on a mother/daughter trip this past summer, and then our family spent Thanksgiving there!). It’s gorgeous in the Summer but even more special in the colder months. 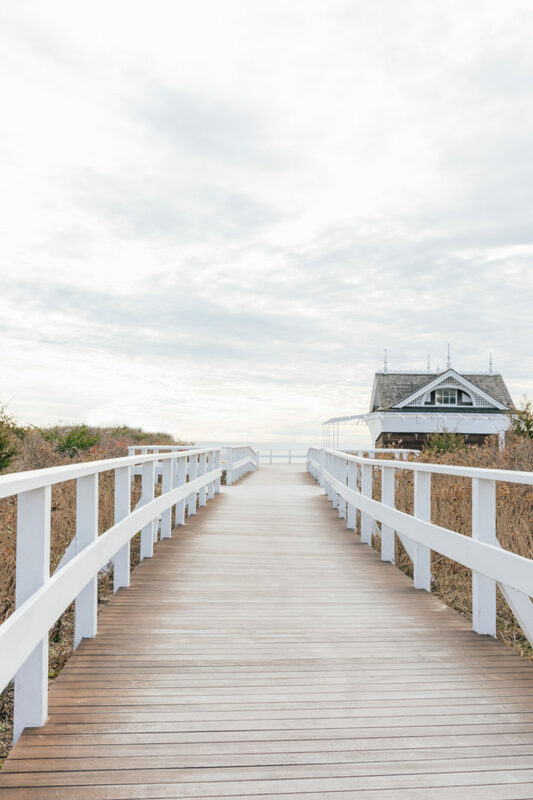 Ocean House is right on the water and has the most spectacular beach. 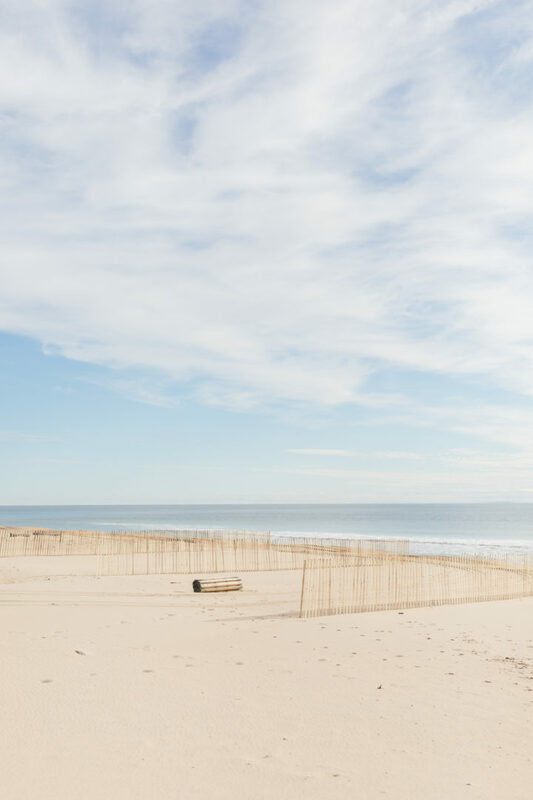 There is something magical about being bundled up with your feet in the sand, and the views are beyond! The best part of the trip, was that I got to spend it with another blogger babe: my friend Julia of Lemon Stripes! Julia and I are both Moms (she has a 16 month old daughter, Amalia) and both in our craziest season of the year. 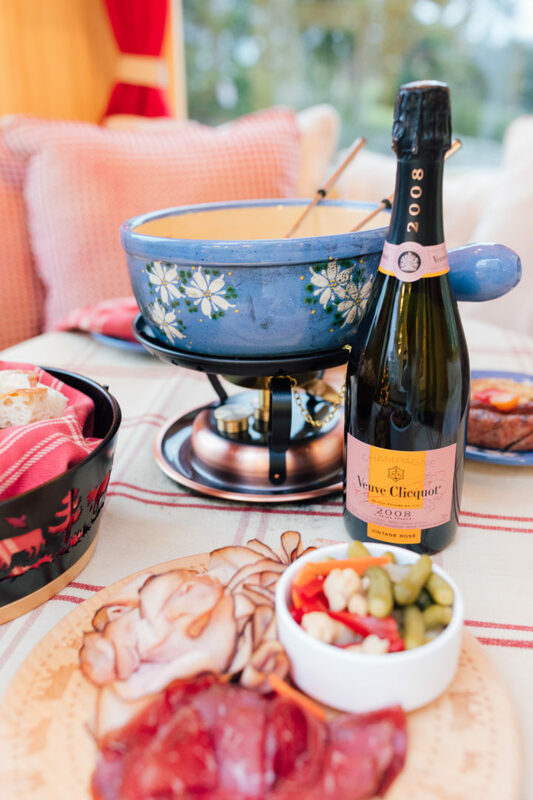 We both had been feeling a bit burnt out, and when Ocean House invited us to come check out their cool Fondue Express activation with Veuve Clicquot we couldn’t say Yes fast enough! We realized this little holiday getaway couldn’t be coming at a better time, and both of us were looking forward to hanging out, drinking some delicious champagne, and enjoying some girl time! It was so nice to be without the kids for a couple days and not worry about feeding anyone or bathing anyone besides myself. It’s amazing how used to doing everything on a kid schedule you become…I almost didn’t know what to do with myself without them to think about! Don’t worry though, guys, I figured it out pretty quickly. LOL. The Fondue Express was truly ADORABLE also. 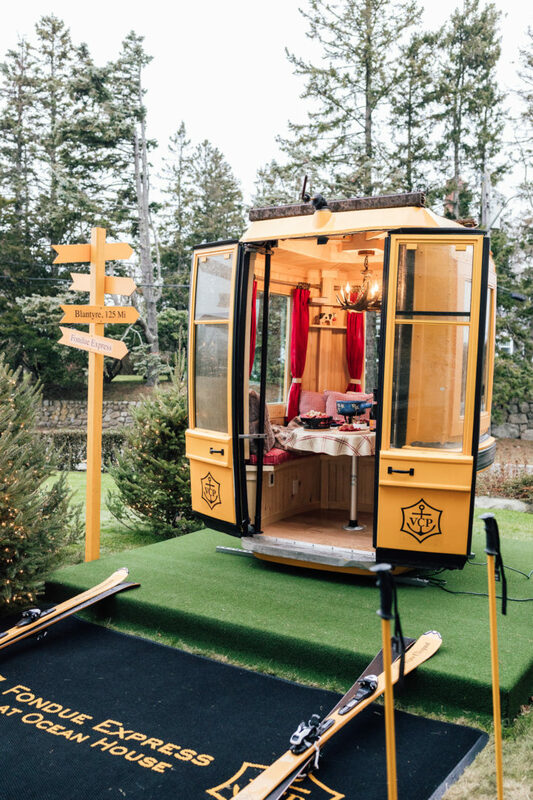 They transported a real gondola car and set up the sweetest little alpine scene right on the Ocean House property. The inside was so cozy, and perfectly styled for the holiday season! 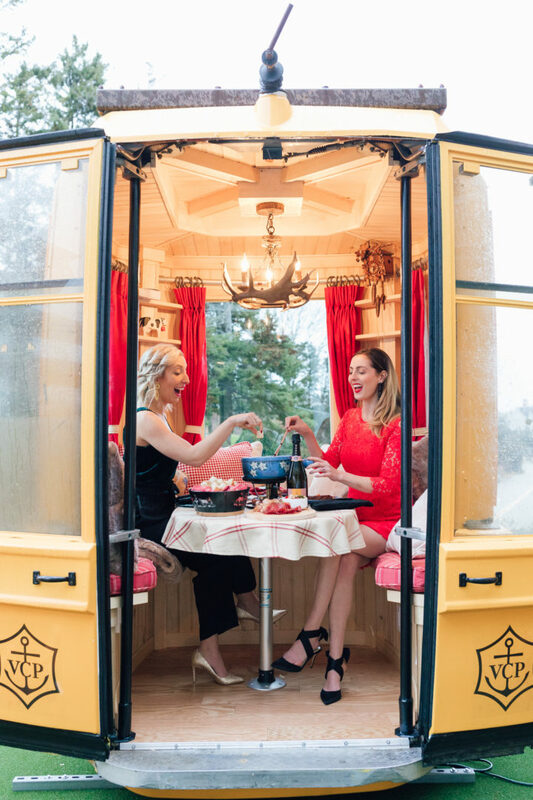 The Fondue Express is open to reserve, and when you do there is a choice between a few different fondue dinner options. All come with the yummiest Veuve Clicquot champagne! 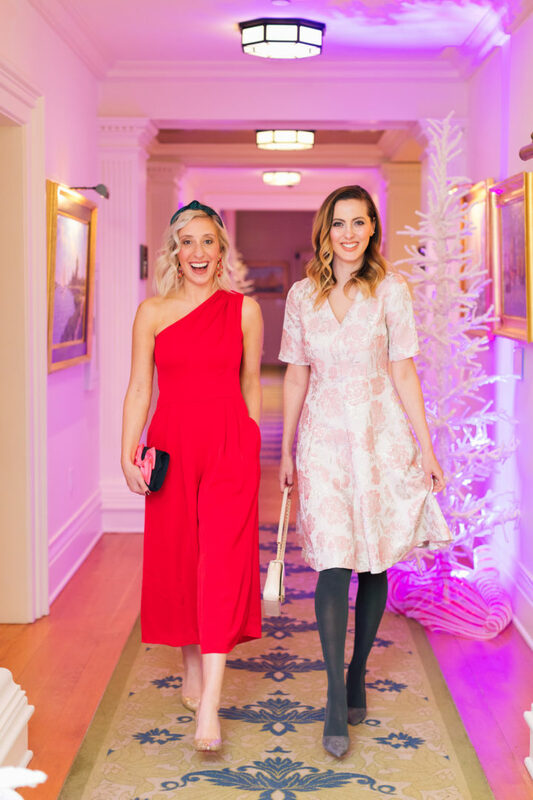 I think its such a fun holiday date night to go on with your main squeeze…and I was happy to go on it with my main Blogger Bae. LOL. But seriously, we had such a blast and it was fun to do something we hadn’t done before! Both of us are allergic to cow dairy so we couldn’t do the actual fondue itself– but there were lots of other things to eat for us on the menu. 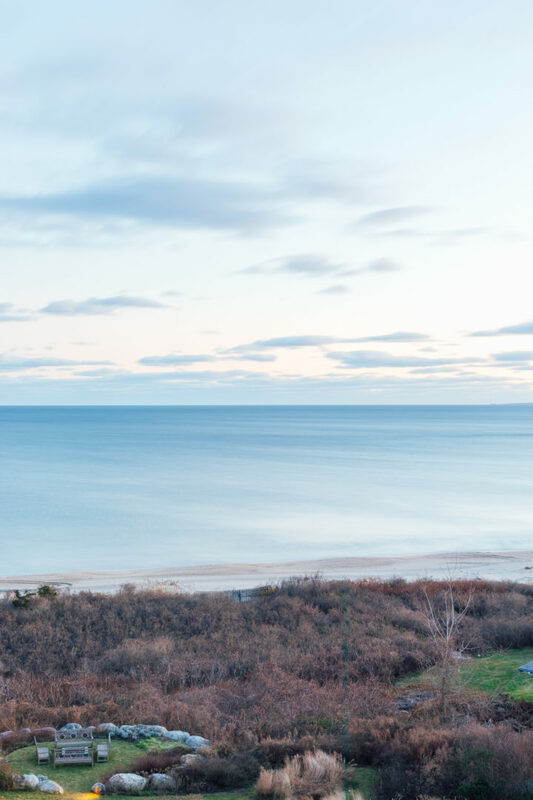 Julia and I explored a bit one day– and went to see the local lighthouse on Watch Hill. The town of Watch Hill is so quaint and totally fulfills all my small town fantasies. LOL. 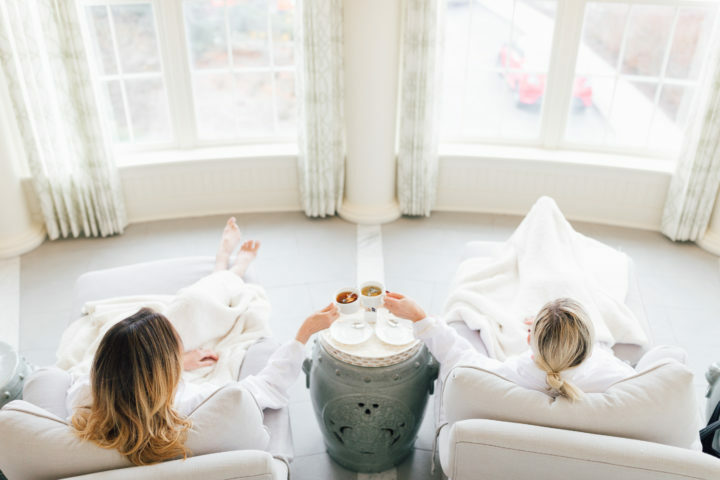 We even hit up the spa at Ocean House, which is amazing if you haven’t been! We were a little tipsy in our jammies one night when we decided that we wanted to do something fun for all of you, with a bit of nostalgia mixed it. 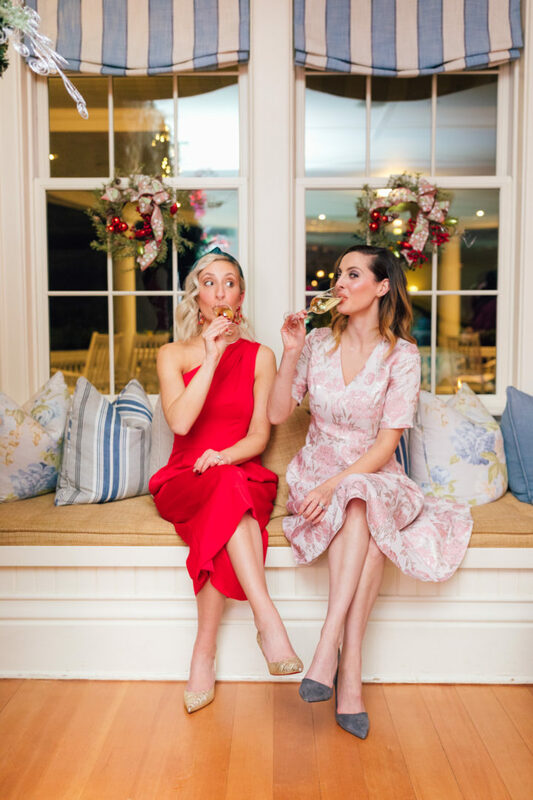 Julia and I have such different approaches to the holiday season (our style is so different also) that we thought it would be fun to come up with a Holiday Persona Quiz for our followers to do with their friends and family! Remember those quizzes we used to do in the teen mags when we were young?! Same idea. We had such a hilarious time coming up with this quiz, and I hope you have as much fun taking it! 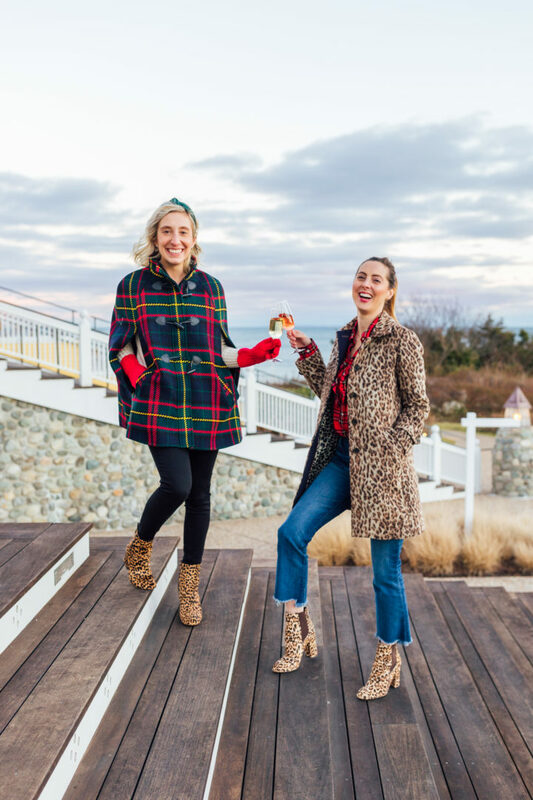 Since it is the holiday season after all, Julia and I want to gift two lucky winners a set of Flannel J.Crew pajamas and a knit pom hat of their choice– just like the ones we wore in these pictures at Ocean House! To Enter: take our Holiday Quiz, and COMMENT BELOW with which “type” you ended up being. You can comment on my blog post here or on Julia’s. Extra entries for commenting on both! We will choose one winner from each blog post on Sunday at 8pm EST. Giveaway open to United States only! Mostly A’s – all traditions here! Your getaway looked amazing by the way! I am a Christmas classic. Love the holidays and love all your posts! Christmas classic … bring on the tartan! This was so fun!!! Split down the middle between A’s and B’s! But both totally suit me- love traditions and am a total homebody! Shocker, mostly D’s!!! Trip looks amazing, fondue is such an amazing throwback. My family used to have it every year on New Years eve! Mostly A’s. I’m a tartan addict and love Christmas traditions! Ahh – I was a mix of A’s, B’s and D’s – so I don’t know what exactly that makes me haha! Fun Quiz, Eva! Oh you know I’m a Sparkle & Shine kinda girl!! I had mostly B’s! Who can resist a good quiz!? Christmas classics 🙋🏼‍♀️- Love putting our tree up after Thanksgiving, reminiscing over ornaments and wearing all the plaid under my Jcrew stadium cloth parka! Such a fun and nostalgic quiz! I’m The Christmas classic! Christmas classic all the way! I’m pretty basic, guys. I got B!! Thanks for the post and happy holidays. I got The Christmas Classic, because it’s true, if there isn’t plaid involved in some way did Christmas even happen??? The Christmas classic! What a fun quiz!! Sparkle and shine at Christmas time! I chose mostly C’s mainly for my love of all things gold! B’s, cocoa and a fire are life. The majority were A’s. Your trip looks like it was so much fun. I’m a hugge honey! Which is soooo accurate!! And love the ocean house! My family has a beach house in Westerly (about 5-10 minutes away) and it’s just so gorgeous! I got mostly As, Classic Christmas, with Hygge Honey following! This was SO fun! Happy Holidays! Mostly C’s – Sparkle and Shine! Pretty spot-on! Mostly A’s! Such a cute idea! Mostly A’s – such a fun idea! As & Ds I’d love a Birkin bag but I’d take it back and pull ornaments off a salvation army tree and buy gifts for the families in need. It’s a split for me! I tied with “The Christmas Classic” and “The Hygge Honey!” I’m all about the traditions of Christmas and I LOVE to snuggle up with my future hubby in cozy clothes on Christmas Eve. So I’m not surprised I got both! 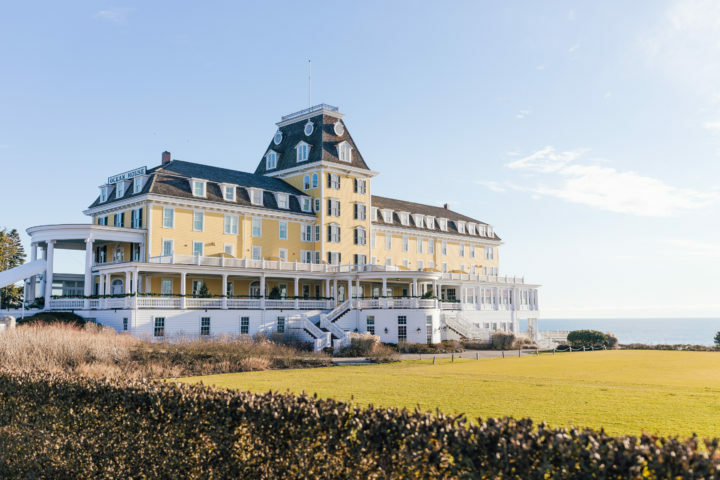 LOVE this post about Ocean House! Looks like you girls had an awesome time. I would so love to spend a weekend at this gorgeous place. Maybe one day! My answers were all over the place, but mostly b’s so I’m the Hygge Honey. Who isn’t listening to Mariah Carey on repeat all December?! I got mostly D’s which surprised me!! Happy Holidays!! Hygge Honey! (With a bit of Christmas Classic splashed in). What a fun quiz! It’s making me even more excited than I already am for Christmas. Happy Holidays to you and your family! Christmas Classic! Love everything about it, but still would like diamonds in my stocking for sure! Christmas classic for me! I’d still love diamonds in my stocking and sugar cookies though!! I got The Christmas Classic!! No shock there ahah! Plaid all day every day until the end of the year!!! Such a cute quiz! Mostly B! And wowzaaa…accurate hehe. Amazing trip! I’m from Bristol, RI and I just love to see people enjoying the beauty of my home state! Mostly B – The Hygge Honey… So fitting for my personality. Great quiz! Christmas classic all the way! Diamonds in my stocking? Yes please! I got Christmas Classic, of course! Boho Ho-Ho-Ho LOL! It me! Sparkle & Shine! Appropriate as my fave word is Sparkle! Sparkle & Shine! Perfect for me as my fave word is Sparkle! Mostly “B”! Looks like you ladies had an amazing time. Cheers to the holidays!! Got The Christmas Classic, but The Hygge Honey was a close second! Some of the answers gave me some great inspiration too for the next few weeks- Such a cute quiz! Love how fun this quiz was! I’m Christmas Classic through and through! I ended up being “Sparkle and Shine”. Go me!! Hygge Honey – minus the Mariah Carey! I think my dream is to up the ante on the Nordic-theme to straight Viking haha! OMG spot on!! I’m a Christmas Classic! Mostly C’s so Sparkle & Shine! Appropriate since my fave word is Sparkle! Merry Christmas! I got mostly A’s – The Christmas Classic. So fun! Love a good quiz! I was a Hygge honey, but Christmas Classics was right behind 🙂 happy holidays! Mostly As with a handful of Bs thrown in and one adorable D (the kitten :)). Fun quiz! I am a cross between A & C – Sparkle & Shine and Christmas Classic! I am The Hygge Honey all the way, and it’s no surprise! This was so fun! I’m the Christmas Classic FO SHO. Ha! You gals nailed it. Looks like a fun little getaway! Hygge Honey – for something I didn’t even know existed before, this is super accurate! Ocean House looks spectacular. Mostly A’s – ALL THE TARTAN!! Mostly B’s Hygge Honey!! Love it! Cozy is life! Christmas Classic! Made me miss all those old teen mag quizzes! Mostly B’s!! Hygge Honey! Love it! Cozy is life!! I am a tie between b and c, with a runner up of a! I guess I’m a good mix! 9/12 A’s and not even a little surprised!! 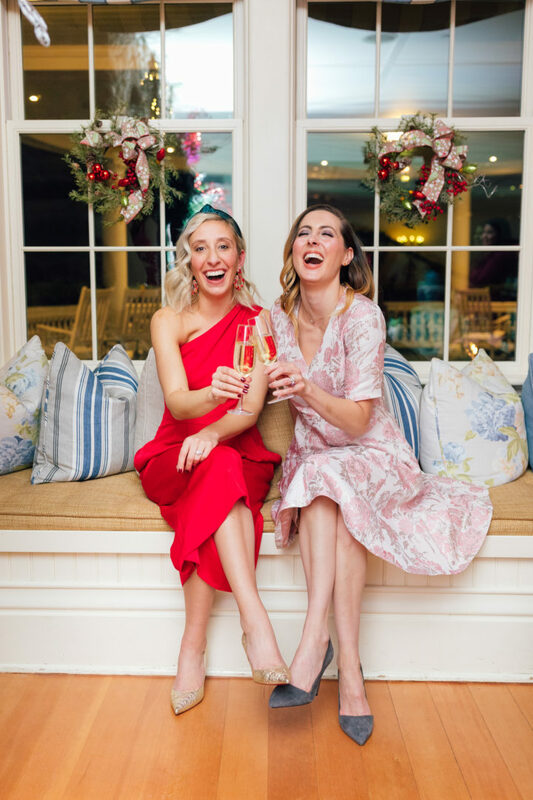 Love the tartan, the champagne, the Christmas carols the day after Thanksgiving, love it all! Such a cute & fun idea. This looks like the best getaway! 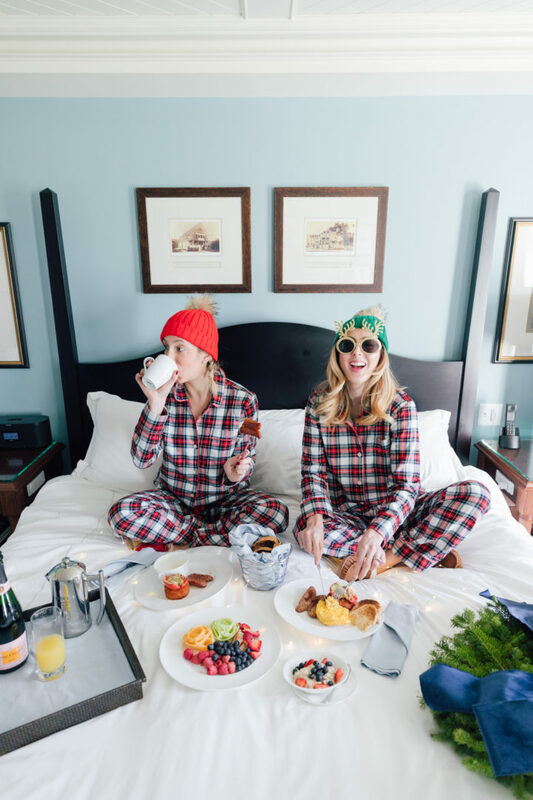 I would love to do something like this with my bestie – I think I’ll plan a trip like this for us with matching jammies as her Christmas present! The Hygge Honey all the way! Majority A’s! 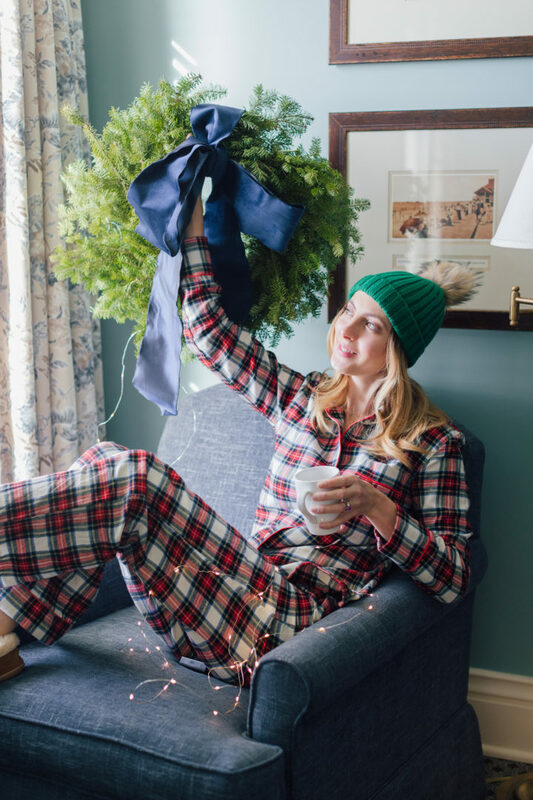 A Christmas Classic – give me all the plaid! Love traditions! Loved this quiz! I got 4 A’s, 4 B’s and 4 C’s!! 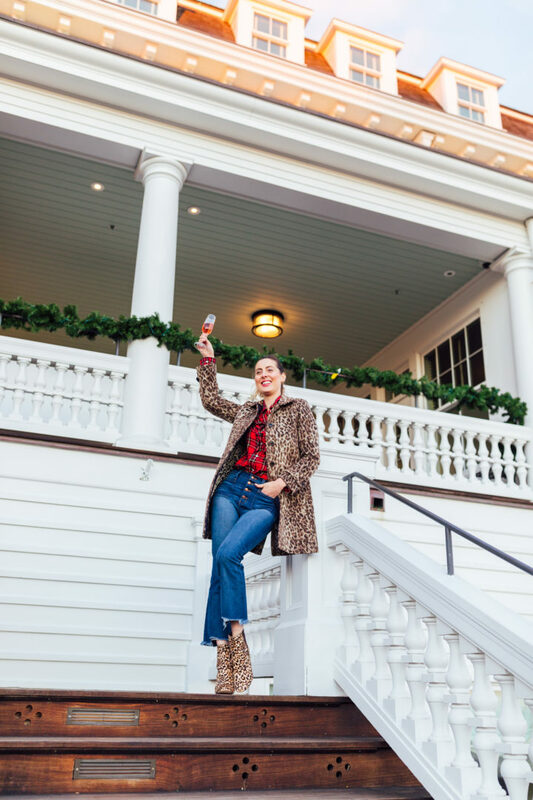 I would say a mix of A and C is pretty spot on – decorating the day after Thanksgiving in my tartan with tons of lights and pillows, but always with champagne nearby! I was surprised to get Hygge Honey (Bs) but once I read the description it fit perfect. I love faux fur and hot chocolate! Christmas classic all the way. And Ocean House is officially on my bucket list, looks so freakin amazing!! Love following your friendship and adventures throughout the year. I got A, Christmas Classic! Although I got a lot of C’s too, because I’m definitely a sparkle and champagne girl also. 🙂 This quiz was really cute and fun! Christmas Classic all the way! So fun! I was a tie between the Christmas Classic and the Hygge Honey! This quiz brought me right back to high school taking personality quizzes with my besties 🙂 My type was The Hygge Honey! Shocked, mostly B’s (with A being a very close second). Hygge Honey here! The Hygge Honey ALL THE WAY (i could tell 3 questions in – super fun quiz!) thanks for hosting such a fun giveaway!! 🙂 Happy Holidays to both of you sweet girls!!! I got Christmas Classic! 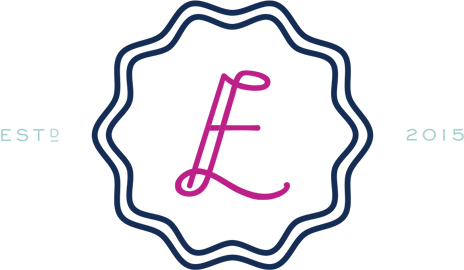 Love this quiz – such a cute idea!! Mostly C’s for me and a bit of A’s. I love Christmas traditions. I got The Hygge Honey — could not be more accurate!! Mariah Carey will be playing for the next 3 weeks straight. My answers were ALL over the place, but more A’s than anything else! The Christmas Classic! I do like a classic red and green Christmas with the works. Christmas also stays up as long as possible after Christmas Day because it is so cozy! Almost entirely A’s – Classical Christmas. I got Hygge Honey, I love the sparkle and traditional aspects of the holidays but with two kids under 2 cozy and indoors is the way to go! Looked like a great escap. Sparkle & Shine @ Christmastime! Sparkle and Shine forevvvveeerrr! Have I worn bright red sequined skirt from the Target Kids section and glittery gift wrap ribbon as a neckerchief to a girlfriend’s Christmas party? Absolutely. Love the quiz, so much fun! Surprise, surprise (NOT! ), I got mostly A’s – definitely a traditional girl! Mostly A’s, all about holiday traditions! That was fun! I got hygge honey! I’m a Christmas classic!! But no surprise there!! I’m a Hygge Honey, but barely! Christmas classic follows close behind. I tied as a Christmas Classic & Hygge Honey, which couldn’t be more true! Coziness all the way. Merry Christmas! Love the quiz idea! Taking those were always my jam in middle school and high school too. I’m a tie between A and B! It fits me well- Christmas Classic toned down a little by some neutral cozy. Totally the Christmas Classic here. Loved this post! I got Hygge Honey! Totally me all the way haha except I don’t do the photo op thing with several pairs of fuzzy slippers- I just have multiple pairs because I have a shoe problem 🤣🤣🤣 Oh, and I usually don’t have the Christmas themed pajamas either, but my baby boy will! Sparkle and Shine at Christmastime ! 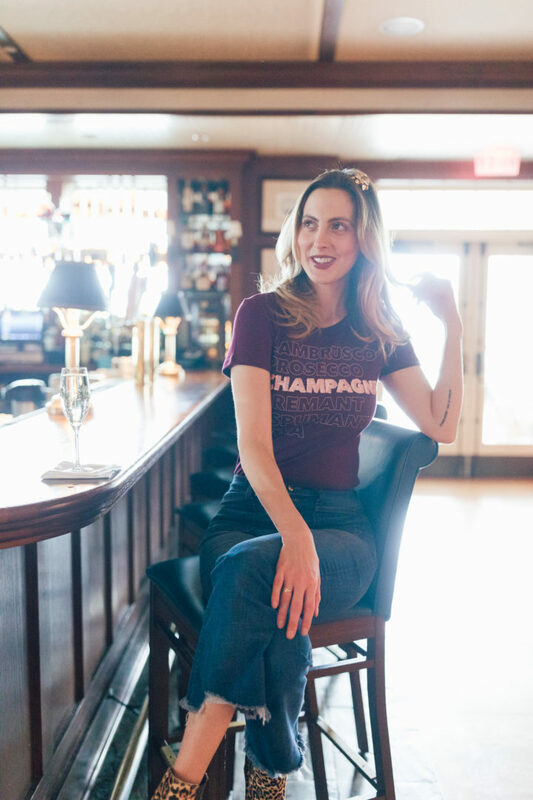 Love all things glitter, gold, and champagne ! Love quizzes! I was a Boho Ho-Ho-Ho with a little Sparkle and Shine. Happy Holidays! I’m evenly split between A’s Christmas Classic and D’s The Boho Ho Ho Ho! Which is perfect for me! I love everything Boho! Mostly D’s…ps your content is always on point! Christmas Classic! And I could actually wear the pjs at Ocean House when I’m in town next!! I got “Hygge Honey”! Nailed it on the head! Love all your photos- looks like such a fun getaway! The Hygge Honey! Pretty much me to a T! During the month of December you can find me in my cozy PJ’s, curled up with a warm blanket and a cup of hot chocolate…just staring lovingly at our beautiful Christmas tree! TIE – Christmas Classic and Hygge Honey. So fun – thank you for bringing me back to my Seventeen mag days! Mostly B’s and totally spot on with the description ❤️ such a cute quiz and happy holidays to you and your family!! This was so fun! I was mostly Ds: The Boho Ho Ho Ho! Bring on the fun do it yourself crafts/decorations and cozy clothes, who doesn’t love a great knit sweater. I’m the Christmas Classic; this quiz was so fun!! Please make more! Mostly B’s: The Hygge Honey 💗 So true! I’m in the A category and was embarrassed to read the assessment – it’s spot on….. We have the tree without fail day after Thanksgiving, a Frasier fir, and last night I had the Bing playlist on repeat. I didn’t think I was that predictable lol. Maybe next year I will branch out to new territory! Classic all the way… except I wouldn’t mind going to Iceland! Classic Christmas all the way! Hygge Honey. Such a cute quiz, well done. What a fun quiz! Reminds me of 17 Magazine! My answers were a mix of all! Does that mean I’m Christmasphrenic? A mix between classic and hygge! Sounds pretty accurate! I answered mostly D’s: The Boho Ho-Ho-Ho!!! Sparkle & Shine at Christmastime! I am all over the place! A three way tie: A, B and D! Hygge Honey. Gimme ALL the cozy stuff! Hygge honey with some Christmas classic for good measure. Bonus points for doing this quiz with a toddler climbing all over me? I was sort of even between them all, but B had a slight advantage! Classic Christmas for me, with a dash of the others thrown in for fun! So fun, I loved those quizzes! I’m an even mix of A and C. I love classics mixed with some sparkle! Give me all the plaid and all the gold glitter. I’m a Christmas classic and it couldn’t be more true!!!! Boho Ho-Ho-Ho…who you calling a ho? Hahaha. A’s & B’s, definitely a mix of both! Mostly A’s for me!! This quiz was fun! Brings back memories of reading Seventeen Magazine, haha. I got a mix of A’s, B’s and C’s. Traditional, cozy, festive. Thanks for the quiz. I am Hygge Honey and I love everything cozy!! Yaaasss. Mostly A’s. Love a classic Christmas! All over the board but I’d say pretty classic with some boho mixed in! I am an A – Christmas Classic! I’m mostly A, with B a very close runner-up. What a fun quiz!! Will we get to see your answers? Hygge Honey over here! Ocean House looks so dreamy. Ahhhh what a fantastic getaway. Fun quiz – thanks, Eva! I am a Classic Christmas girl all the way! Loved the quiz! Such a fun quiz! I got mostly Bs, with A as a close second. Hygge Honey! I’m the Christmas classic for sure! It describes me perfectly all the way to the music choices! Thanks for the quiz – got mostly B’s Hygge Honey. Love making anything cozy! A all the way!! Love a Christmas Classic! Mostly A’s. I love the classics! Christmas Classic!!! Of course!! Wonderful post — thank you for sharing. Looks like an amazing place!! Christmas classic gal – fun idea with the quiz!!!! Team Christmas Classic here! Love using vintage things from my grandmothers! Have visited Ocean House twice for lunch and it is so lovely! 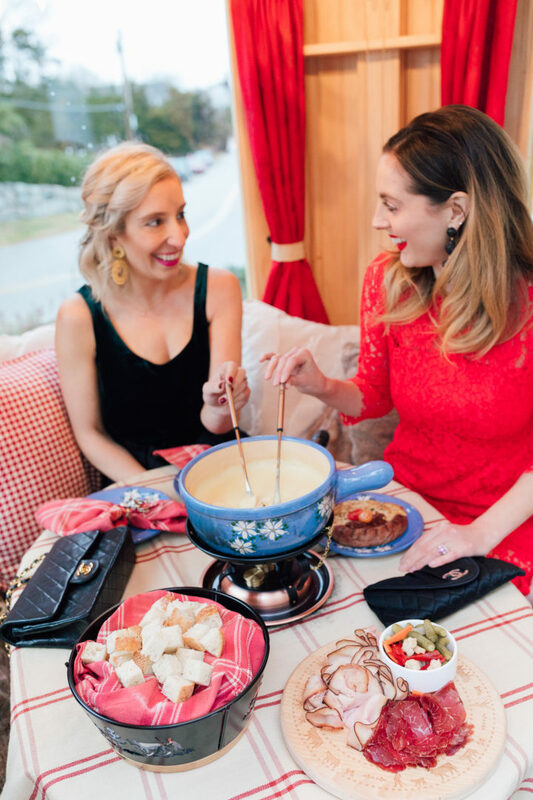 The fondue express looks like a blast! Christmas Classic! Such a fun quiz! Mostly Classic (A) with a few variations to keep things interesting! I’m a hygge honey! Totally me, cozy all the way. I am a mix between the classic A and glittery C! I love traditions and plaid along with sparkle, champagne, and a red lip! The Classic Christmas ALL THE WAY! Loved the quiz!! I’m a perfect mix of Christmas classic and Hygge Honey! I got a mix of A & C, or a mix of Eva and Julia, I should say! Haha. CONGRATS CAITLIN! You won the giveaway! Email me at hi@happilyevaafter.com and I will get all your sizing/color preference info! Sparksical! (Sparkle and classical). Plaid, plaid, and more plaid with a good shot of sparkle! Loved the quiz and all of your BEAUTIFUL photos. Loved learning that my new blogger finds are friends! Currently wearing my Park Slope in Neon Pink and Baby Girl is getting one for Christmas! Keep up your beautiful work! Thank you! Merry Christmas! I got The Hygge Honey! The description is uncanny! 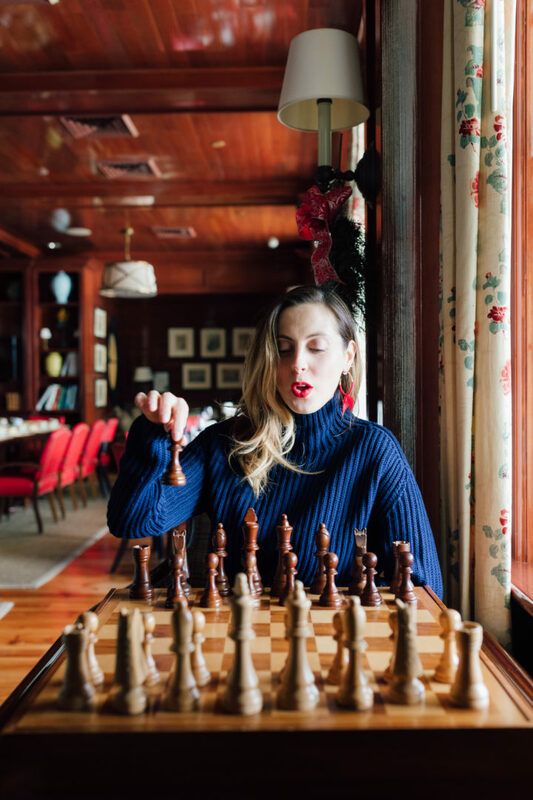 Personality quizzes have always been a favorite activity, so I’m glad you’re bringing them back! I’m definitely Sparkle and Shine at Christmas Time!!! Such a fun quiz, I was Boho Ho-Ho-Ho. Strange split between the Christmas traditionalist and sparkle and shine!! I got the Hygge Honey! Doesn’t surprise me at all. I love cozy cozy cozy! Love those flannel pjs. Fun quiz! I was the same amount of A’s & B’s 🙂 Thanks for sharing! I got half As half Bs! You should have a tie breaker! Though honestly, I am definitely a little bit of both! Happy holidays! Looks like you both had a well deserved escape! I took the quiz and I am the Christmas Classik. I just love your posts. This quiz is such a cute idea! I ended up with Sparkle & Shine!